Need to make a quick citation for a report or an article? No time for downloading and importing paper in the Mendeley? Well, NoodleTools Express is quite helpful for this purpose. Most researchers don’t recommend the online citation tools over the desktop ones. Few of them still prefer to write the bibliographies on their own without any assistance of software. But you always don’t have time for this. Using NoodleTools, You can make citations and bibliographies in MLA, Harvard and Chicago style. Following tutorial will help you to make the citation Noodle tools Express MLA citation. Go to the website of the online citation generator and click on the desired citation style. In our case, it’s MLA Citation style. There are several citation types you can choose from, but we will go for the Journal for research articles. You can also choose a book, newspapers, court papers etc. 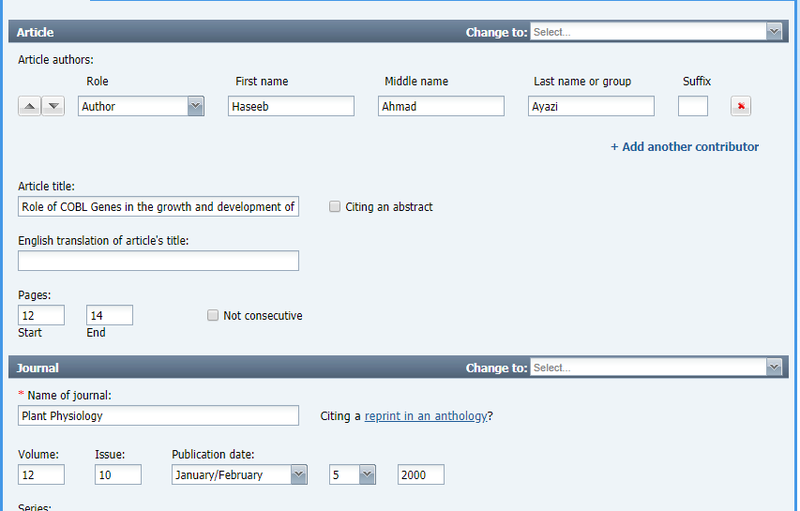 Add all the necessary details of the research article and journal into the tool and click on the save. Italics may be lost when you transfer your citation to a word processing document so you may need to replace it. Lines that wrap should be indented 5 spaces or 1/2 inch. I hope this quick tutorial will help you in citing the documents using MLA. If you wish to produce more such tutorials, feel free to suggest us in below comment box. Do you any Online Citation Generator tool better than this? Please share with us.